Last year, we had a whale of a time up at Killdeer Plains putting on a general natural history workshop for the Ohio Certified Volunteer Naturalists and other interested people. It was a great way to learn about a variety of subjects, ranging from birds to plants to butterflies to dragonflies. We even had a nocturnal excursion, which turned up lots of interesting and seldom seen creatures. A jumbo Cloudless Sulphur butterfly, just one of scores of neat animals that we found in 2009. 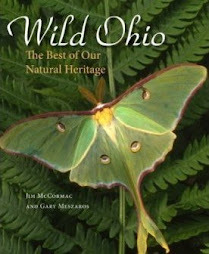 The Ohio Certified Volunteer Naturalists (OCVN), in collaboration with the Ohio Division of Wildlife, is hosting a natural history workshop from July 16th – 18th. The venue is Killdeer Plains Wildlife Area, about an hour north of Columbus. Killdeer Plains protects one of Ohio’s best remaining prairie remnants, and is full of interesting biodiversity. Experts will present indoor programs each morning in the Sportsmen’s Center, located in the heart of the wildlife area. Afternoons will be devoted to field trips. 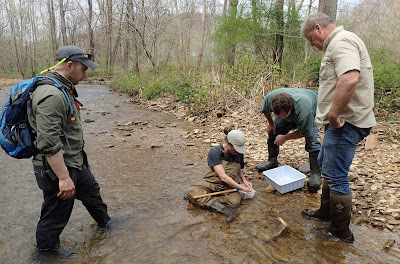 Programs will focus on botany, birds, beetles, and butterflies, and participants will spend time in the field with each expert. 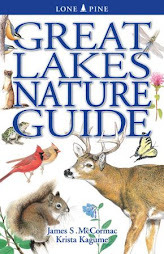 Experts include Dave Brandenburg, author of the newly released Wildflowers of North America field guide, the best and most comprehensive book of its kind to date. The other instructors are Jim Davidson (butterflies), Bob Placier (birds), George Keeney (beetles), and Jim McCormac (wetlands). OCVN members receive credit for participating in this workshop. There will also be a nocturnal foray on Saturday night, which should produce owls, amphibians, many species of singing insects, moths, and other fauna. Cost is $60.00 and includes most meals. Inexpensive lodging is available in nearby Upper Sandusky (15 minutes) at either the Comfort Inn or Amerihost Inn. Cope's Gray Treefrog, Hyla chrysoscelis, Hocking County. I was at a friend's place, and several of these little charmers were utilizing the swimming pool. The frog above is perched on the lip of the pool. One of them had even taken up residence in a wren nest box, and would peer from the entrance at his admirers! This is a male, and he was busy vocalizing. You can see his deflated throat pouch. Cope's Gray Treefrogs sound superficially like the visually identical Gray Treefrog, Hyla versicolor, but are pretty easy to tell by voice. They emit an astonishingly loud raspy trill. Note the animal's conspicuous toe pads, which allow it to readily climb trees and other objects. Sundrops, Oenothera fruticosa. These little primrose are rather uncommon and local in Ohio, occurring in perhaps half of our 88 counties. It is one of the more diminutive of the primroses; certainly but a shadow of the abundant and widespread Common Evening Primrose, O. biennis. This species usually is found in relatively high quality, undisturbed sites, and these plants were growing in a wonderful Adams County cedar glade prairie, where they were companions to a number of rare flora. The same prairie that produced the sundrops also yielded this dragonfly: a Spangled Skimmer. Note the conspicuous white stigmas, or marks on the outer leading edge of the wings. These aren't particularly common in Ohio, at least in my experience, and we were delighted to see this one. You may remember this lovely lilypad-trotting violaceous gem of a big-footed, candy-corn billed swamp beast known as a Purple Gallinule. The one above graced a pond in Columbia Reservation, Lorain County, Ohio, for much of the month of May and became quite the celeb. Linda Paull, the park manager, was every bit as much a jewel as the bird was, and welcomed birders with open arms. The birding community owes a debt of gratitude to Ms. Paull; would it only be that every rarity had such a gracious host! watch how excited people were to see the beauty. brought us, but it was well over 2300 people. This estimate was done by the road counter and sign ins on the high class registration chair. Also taken into account was the weather and observations of how many people were on the trail. We had cars from Pa, Wv, Mi, Ny, and Ind here just to see the bird! (some were not on their way to Magee). There was also people here from New Jersey and Oregon but they were visiting in the area. gallinule at Sandy Ridge Reservation which will be held in August. you?...Oh you are the gallinule girl". Hopefully another bird will put us on the map again in the future. 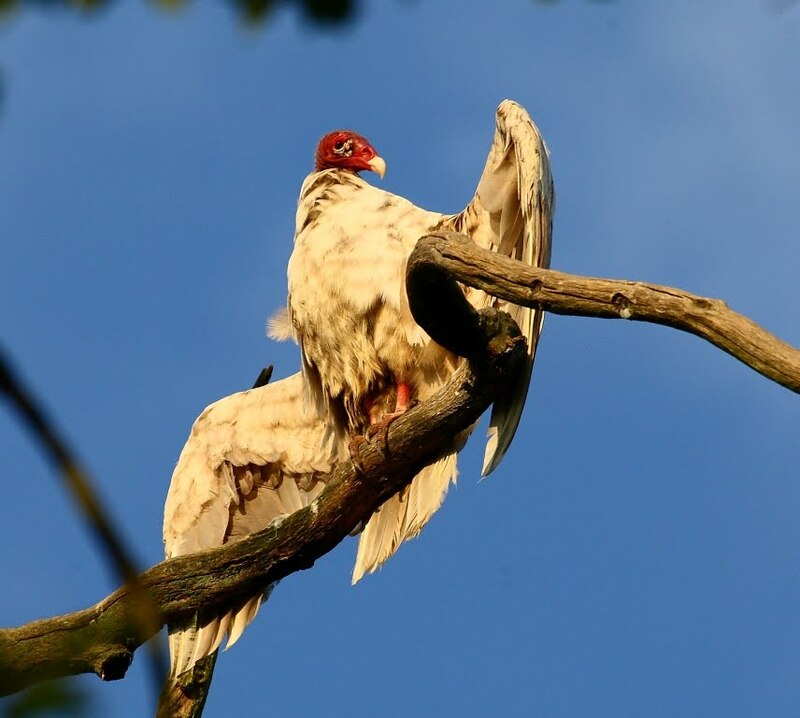 Leucistic Turkey Vulture, Holmes County, Ohio area. Photo by Dane Adams. Paul Hershberger recently sent along some interesting photos and observations from the Trail, Ohio area that he was gracious enough to allow me to share. All photos are by Dane Adams. While out exploring last Saturday, Dane and Paul came across this striking specimen. Turkey Vultures are common enough, but individuals such as this certainly aren't. "Whitey" is a highly leucistic specimen, and must stick out like a sore thumb. Leucism is a genetic condition that causes dark pigments to be washed out, in a nutshell, causing excessively pale individuals. A true albino would have pink eyes, likely be stark white, but probably would not have made it out of the nest. 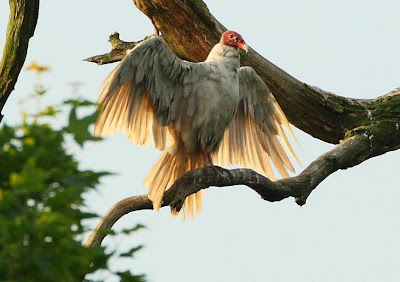 Pure albino birds often suffer from greatly weakened feather shafts and other impediments caused by the albinism and don't survive to adulthood, at least species that attain this size. It'll be interesting to see how long this bird lasts. Some years back, around 2000, there was a similar Turkey Vulture that spent its summers in Belmont County, and was widely seen and reported on for quite a few years. Ghostly-looking Barn Owl. Paul reports that these owls are having a good nesting season in the Holmes County region, following a winter of high mortality due to deep snow cover. Barn Owls are at the northern cusp of their distribution in Ohio, and are vulnerable to prolonged nasty winter weather. 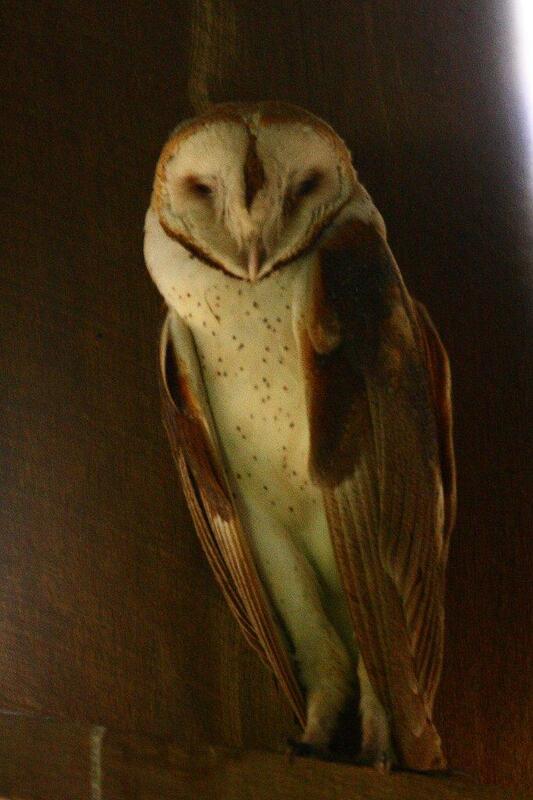 Globally, this is the most broadly distributed of all owls, found on every continent but Antarctica. 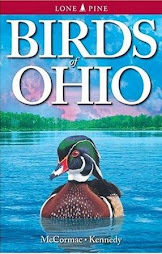 They pushed northward into Ohio following the opening up of our vast forests that blanketed Ohio prior to European settlement, which created favorable habitat for the birds. 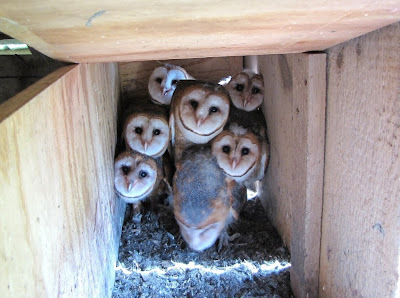 A large family of owlets peer from a nest box. Barn Owls can respond rapidly to favorable opportunities, such as a boom in food sources. Meadow Voles - a small mouse-like rodent - must be doing well in the meadows up that way, leading to large broods such as this one. Normally, a clutch of six eggs would be on the large end of the brood size. Here's hoping that the "monkey-faced owls" flourish up there this year, and kudos to all of the farmers who provide nest sites for them, and even provide food during brutal winter weather. Thanks to Paul and Dana for sharing these great birds. My cousin Paul, perched on a rock high on a mountain slope on Alaska's Kenai Peninsula. That's his Icelandic Sheep Dog, Jonah (the smaller one). Paul used to live here in Ohio, but moved to Alaska about two decades ago and hasn't looked back. Can't say I blame him. Paul lives in Seward, a town of a few thousand hard on the shores of Resurrection Bay, about two hours south of Anchorage. His house is the first one on the left, and the backdrop is magnificent. Black Bear and Mountain Goat are sometimes seen on that mountain - great animals for the "yard list"! Pine Siskin, Steller's Jay, Orange-crowned Warbler, Fox and Golden-crowned sparrows, Common Raven, and Black-billed Magpies were some of the daily locals. One morning, a Bald Eagle was hopping around in the neighbor's yard. An incredibly gracious guy, Paul put us up for our stay, and provided lots of adventure. He is one of the more interesting people you'd ever meet. 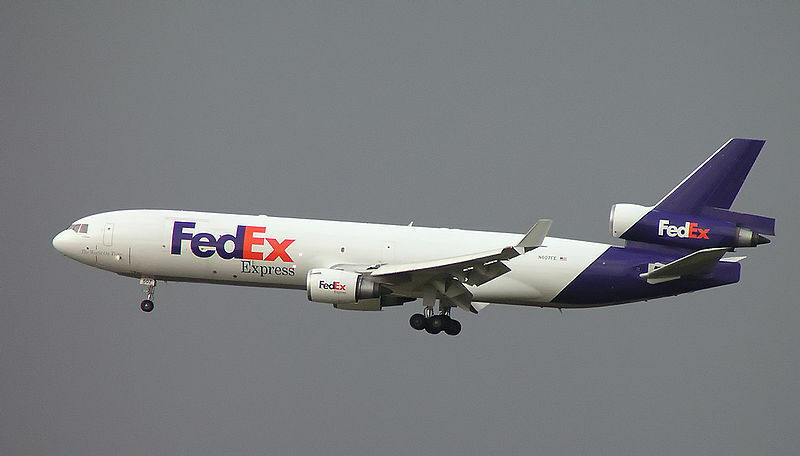 This is Paul's office - a jumbo jet converted to haul FedEx cargo. 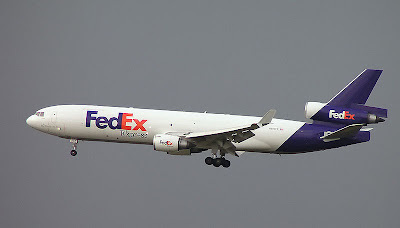 He is a pilot, certified to fly jets and helicopters, and travels the world moving freight in a high and mighty way. One of his other passions is sailing, and that's his boat - a 37 foot sailboat that he navigates all over the coasts of southeast Alaska. From what I could tell, sailing one of these things is far more complex than squeezing the throttle on a power boat, but Paul easily handles the craft solo. In the above shot, we sailed to a remote cove off of Resurrection Bay, anchored, and took the dinghy ashore to explore on foot. This is an excellent way to get WAY off the beaten path, and see lots of interesting places and wildlife. One of the treats of sailing these waters are the Dall's Porpoises. Looking like miniature Orcas, these aquatic mammals are playful as puppies. When they spot a boat, over they come, charging and frolicking about the bow, often coming within inches of the vessel. Check the video above, which I made from Paul's boat. That's Jonah the Icelandic Sheep Dog barking in th background - he gets very excited when the porpoises come about. There he is, all geared up for seafaring. Even Jonah has to wear a life vest. You don't want to mess around on boats up here - the water is frigid enough that man or beast wouldn't last long if they weren't promptly fished out. Paul's also a big runner/skier/snowshoer, and used to own lots of sled dogs. He is - no kidding - a finisher of the fabled Iditarod dog sled race, which entails nearly 1,200 miles of mushing in brutal terrain in often EXTREMELY inclement weather. His next challenge is the Mount Marathon foot race on July 4. I've been on the mountain that participants run up, and down, and to say it is a challenge would be a gross understatement. Finishers often cross the line battered and bloody from falls. It was great to see my cousin again on his home turf, and we were indeed fortunate to have such a great host and guide. A wildflower instantly recognizable to any Ohio botanical enthusiast, the Virginia Bluebells, Mertensia virginica. It is the only of its ilk found here. One of the great things about travel is seeing a broader spectrum of flora and fauna, which drives home the fact that there are often many more species in a genus such as Mertensia than what we see in our own backyards. Gaining a bigger picture view of plants and animals helps one to gain a better understanding of evolutionary lineages, differences among species, habitat niches, in addition to the sheer enjoyment of seeing interesting new relatives of well known and familiar species. There are 18 "bluebells" in the genus Mertensia in North America, and this is Tall Bluebells, M. paniculata, photographed on the Kenai Peninsula in Alaska a few days back. Most bluebells are westerners and northerners. Tall Bluebells are rather gangly; not as stout as our Virginia Bluebells. Nonetheless, like most of its brethren it is a striking, eye-catching plant. This was my hands-down favorite amongst the bluebells: Oysterleaf, Mertensia maritima. It's the light green prostrate plant on the left, seen growing with Beach Pea, Lathyrus japonicus (The latter is threatened in Ohio; in much of Alaska it is a weed). When I first saw it, I was initially flummoxed until I took a closer look at the flowers. Oysterleaf grows in sandy, rocky beaches along the sea, and like many salt-adapted plants, its foliage is quite thick and leathery. Where I saw it, the Oysterleaf was at or near the front lines of high tide wave action, and its prostrate habit no doubts helps it cope with regular beatings by the surf. Kneeling down for a close inspection of the flowers instantly reveals it to be a member of the Mertensia clan, albeit quite a different cup of tea than what we are used to seeing in Ohio's spring woods. Black Bear, prancing along the shoreline of Resurrection Bay. Surprisingly, we only saw one, but did note plenty of fresh signs of bears on our hikes. Black Bears are very plentiful up here. We also saw a Grizzly Bear, at fairly close range. One has to be aware of these beasts when venturing far off the beaten track, but adverse bear/human encounters are very rare. Hope to be back in the Buckeye State sometime in the near future! Glacial lake with beaver dam, mountain pass about two miles off the Sterling Highway, Kenai Peninsula. Moss Heather, Cassiope stelleriana, remote valley near mouth of Resurrection Bay, Seward area. Black-billed Magpie, junction of Seward and Sterling highways. Intricate patterns of emerging Green Hellebore, Veratrum viride, alpine meadows of mountain pass, Kenai Peninsula. Woolly Lousewort, Pedicularis kanei, rocky scree of ridge on St. Paul Island, Pribilofs. Arctic Fox, St. Paul Island, Pribilofs. Western Columbine, Aquilegia formosa, White Spruce/Balsam Poplar forest, Kenai National Wildlife Refuge. Rock Sandpiper, St. Paul Island, Pribilofs. Rock Sandpiper nest, St. Paul Island, one chick hatched, one pipping out of egg. Golden-crowned Sparrow near timberline, mountains in the Kenai National Wildlife Refuge. Red-necked Phalarope on cold lake, St. Paul Island, Pribilofs. Cow Moose with calf, Anchorage. Mew Gull bugling from tree perch, Tern Lake, junction of Seward and Sterling highways. Alpine meadow high on mountain slope, Kenai National Wildlife Refuge. Northern Fur Seals, hauled out on a beach along the shore of St. Paul Island, Alaska. One of the real thrills of visiting this remote place was the chance to see these massive seals. About 70% of the global population breeds on St. Paul - perhaps 500,000 seals - so they aren't hard to find. The bulls come ashore first, and establish territories. Later, the cows arrive and a real stud bull might have up to 40 in his territory. A gargantuan male in repose. Inelegant and short of social graces, the bulls emit loud bellows that can be heard for at least 1/3 mile, and often spar with their neighbors. A real big boy might be over 7 feet long and weigh 600 pounds. They allegedly have the second densest fur of any mammal, bested only by the Sea Otter. I believe it, having now seen them in their element. Fur Seals spend up to 10 months at sea, and a frigid sea it is. It must feel good to hit the beach once in a while. Northern Fur Seals are the reason that the Pribilof Islands are now inhabited. The Russians discovered seals here in the 1700's, and essentially enslaved Aleuts that were living in the Aleutian chain and brought them to St. Paul and St. George islands. There, the native peoples were forced to harvest and prepare seals for the Russians, who made enormous profits from the animals. Northern Fur Seals may look cute, but don't be deceived. They are ill-tempered and quite capable of putting the hurt on anyone foolish enough to venture too close. Amazingly, the traditional method of harvesting them is with the use of long clubs, a tactic that would require some nerve on the part of the hunter. The natives still harvest about 250 annually, all 2nd year males. Fur Seals are declining, and birth rates have fallen to alarming levels in some recent seasons. The population drop probably has nothing to do with the limited subsistence harvesting by native peoples; rather, it speaks to overfishing of the Bering Sea by commercial fisherman, most likely. Your blogger, standing at the summit of cliffs 200 feet above the Bering Sea. Our crew spent three days out here, on the largest of the four islands that make up the Pribilofs, St. Paul Island. About 438 people live here, and the place is best known as a port of call for crabbing boats featured on the TV show Deadliest Catch. Birders know St. Paul as a fabulous place to catch Siberian and Eurasian vagrants. Some years are better than others for that, and this has been a very lean spring for rarities. I could care less - the island is packed with incredible birds, and I'll share a few that were breeding on the cliffs behind me. The most numerous of the alcids - penguin-like seabirds of the northern hemisphere that still have the power of flight - is the Least Auklet. Many thousands nest on St. Paul. They aren't the flashiest of the alcids, as we'll see, but this species is my favorite. They are only six inches long - same as a Lapland Longspur! - but cope well with the severe elements in this part of the world. Platoons would fly by, skimming the roaring surf, dropping into the frigid water and bobbing about as if it were the tropics. Parakeet Auklets were everywhere, sporting a day-glo red bill and a flashy white eye plume. I spent some time laying on my belly on the summit of the cliffs, peering over at the birds, who in turn would peer curiously back at me. This one was only 15 feet or so away, and completely unbothered by me. The eye of a Parakeet Auklet looks like a perfect white button, and lends a completely inscrutable look to the animal. A Crested Auklet shares a rock with a Least Auklet. The sooty-gray cresteds sport an odd comb-like crest, anchored above a bright orange bill. Like the other auklets in the genus Aethia, it has a bright white eye. Without doubt the "cutest" of the alcids are the Horned Puffins. They have a very gentle, winsome look, created by that little black horn over the eye. Note its very erect posture - alcids' feet are located far back on the body. This is great for underwater dives, allowing the birds to swim like fish and run down piscine prey, but necessitates an upright bearing when on land. Big and mostly black, the Tufted Puffin is a striking bird. Like the others, it nests on small rocky ledges and in recesses high on windswept cliffs overlooking the sea. Such locations keep them out of harm's way. St. Paul is full of Arctic Foxes, but even as agile as these mammals are, they can't gain access to sites like this. I watched this puffin for some time. He was unconcerned with me, and it was interesting to watch him lying on a ledge 150 feet above the rocky shore, looking around mellowly at the great sea and taking in all of the action around him. Seabird colonies are a riot of sound, smell, and activity, with birds constantly coming and going, calling to greet mates, scold intruders, and always the freight train roar of the crashing surf. The puffin appeared unfazed by it all. A trio of Common Murres share a ledge. Both this species and the Thick-billed Murre are common here. Thick-billed Murre. It differs from the species above by that white whisker mark, and it is also blacker above. Visiting St. Paul Island wouldn't be for everyone. The weather, even in mid-June, is raw and blustery, and drizzle can be a near constant. Temperatures stayed in the 30's-low 40's, and the sun almost never showed in the three days I was there. Fog was nearly perpetual, and caused the the next two airplane flights to the island after ours to be canceled, as the pilots couldn't see well enough to land. That was especially unfortunate to us, as our luggage had been bumped from our flight due to weight limitations, and was to arrive the next day. We never got it - just picked it up back at the Anchorage airport when we returned. But any hardships are small potatoes in exchange for the opportunity to see the explosion of life during the all too brief Bering Sea summer.